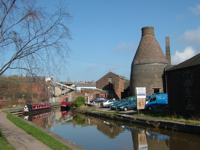 The UK's historic environment has been widely recognised as an important national economic and cultural resource. This resource is both highly diverse and affected by a wide range of, often intertwined, pressures. 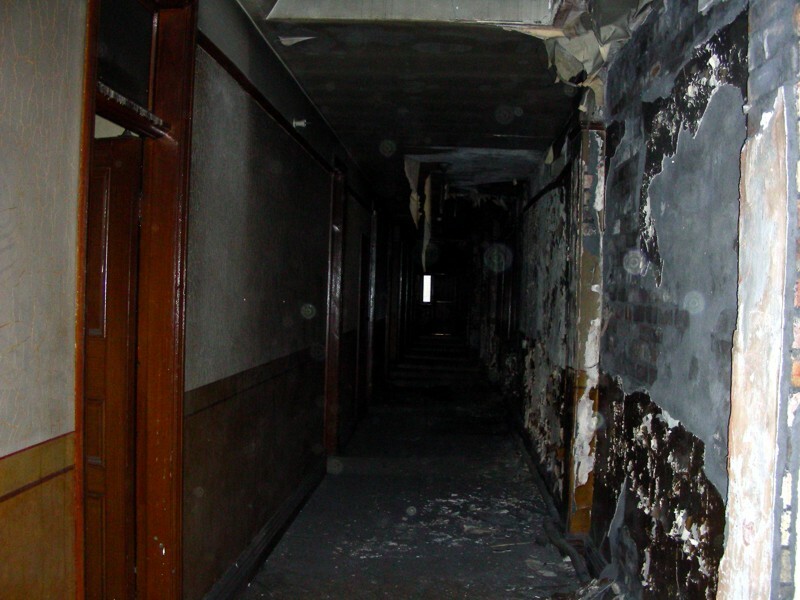 Whilst huge progress has been made over the past century in understanding, conserving and presenting various aspects of our historic environment, studies have tended to be very fragmented and usually focused on a single challenge to one type or location of historical environment. In order to manage this important resource more effectively over the 21st century, improved and genuine cross-disciplinary research effort is needed. One key barrier to such improved research is the plethora of different methods utilised by workers with backgrounds in different areas of arts, humanities, social sciences, and sciences. Our research cluster provided an effective, productive, tangible, and imaginative way of bringing together experts with a wide range of methodological experience relevant to the study and management of the historic environment in order to create new awareness and facilitate development of co-ordinated future research collaborations. These aims were met through a developmental sequence of meetings involving core participants, organised by a well-qualified cluster research assistant who, with the Principal Investigator and Co-investigator was responsible for steering the whole research cluster over the year of its operation. We involved 23 core participants in fields ranging from synchrotron radiation applications to video art. An initial meeting in Oxford on 5-7 January 2007 on 'Introducing methods for studying the historical environment' brought together 20 expert participants from fields as diverse as microbiology, computing based-archaeology, oral history, curatorship, socio-economic studies, and professional photography to share information on established, new and potential methods. This meeting was followed up by the production of a series of briefing notes on different methods. A second meeting in Burslem on 2-4 April 2007 on 'Methods in action: addressing issues of Burslem's historic environment' was hosted in association with Janet Miller from Atkins and confronted participants with the problems of regenerating Burslem's historic environment. Participants were split into small groups to consider in detail small aspects of the historic environment and how a range of methods could be deployed to study, conserve, enhance, and market the resource. This meeting will be followed by the production of a tangible output, determined by the participants at the meeting in discussion with local interest groups, for the local area. 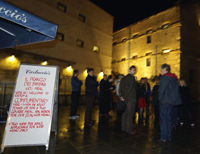 The final meeting was held in Oxford on 17-19 September 2007 to focus on 'Advancing methods together'. 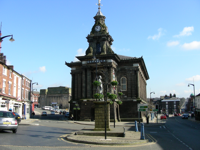 The meeting had a workshop format with small groups of participants producing draft grant proposals (based on either Burslem or themes and issues raised at the Burslem meeting) and presenting them to an invited audience from grant-giving bodies and agencies involved in the historic environment. Our first meeting was successful in bringing together experts from diverse areas, spanning history, quantitative photography, human geography, archaeology, geology, engineering, conservation, microbiology, video art, planning, geomorphology, and computer applications. Katy Lithgow, Head Conservator, The National Trust was our guest speaker, discussing methods used in the study and conservation of collections. The field trip was held in the evening of the second day of the meeting, at Oxford Castle. 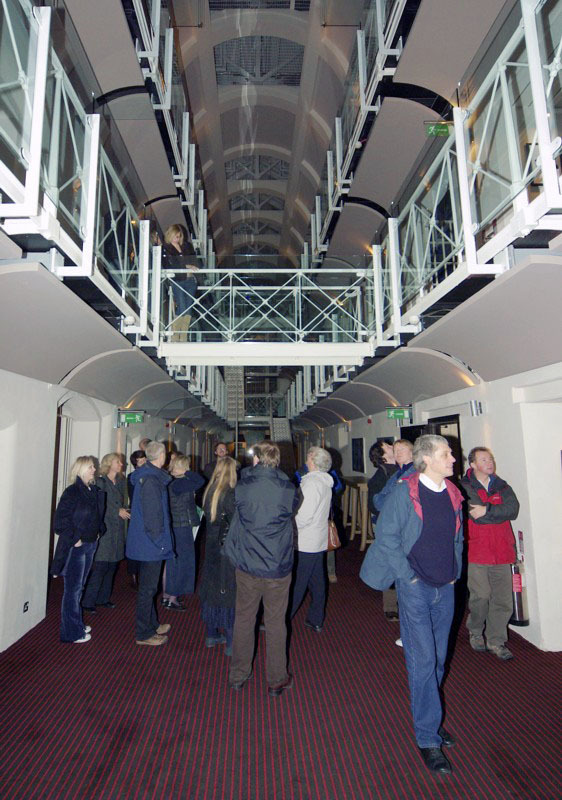 Debbie Dance provided us with a guided tour of the exterior of the site, including a glance at the new hotel located in the old prison. This was an exciting excursion because of the novelty of the site and its representation as a successful restoration of a historic site with much value for cultural heritage. 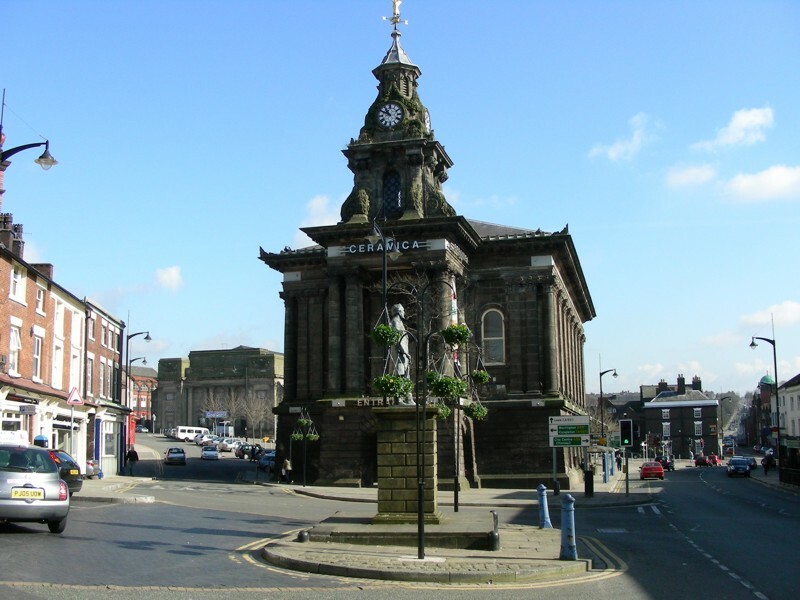 There also included an introduction to the upcoming meeting in Burslem, given by Janet Miller, Head of Heritage, Atkins. This generated much enthusiasm from participants, who are looking forward to put their approaches forward in interdisciplinary projects. Though the research cluster is entitled 'Consensus or collision? 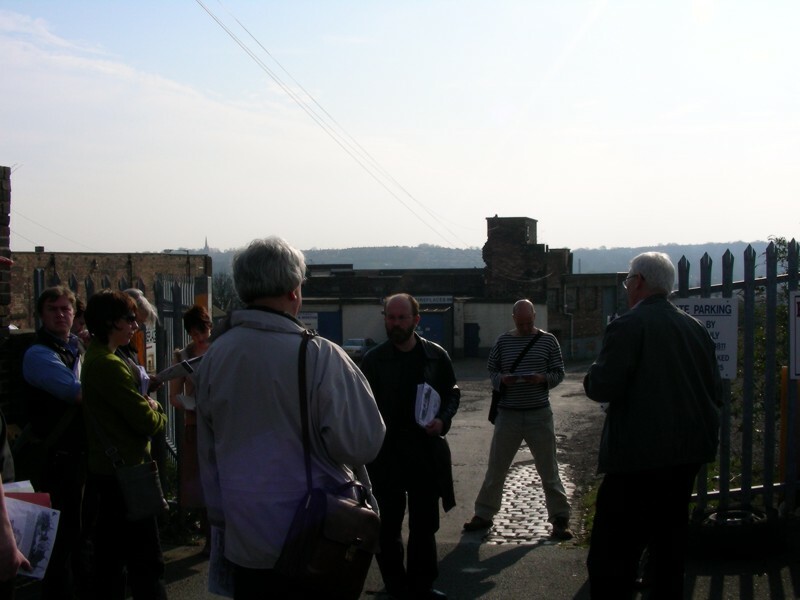 A site-specific approach to integrating methodologies for the historic environment', there were no overt collisions and members of the group seemed to welcome different approaches and methodologies. 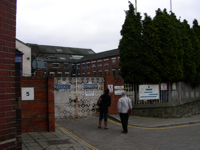 If this meeting was an indication, the Burslem meeting should also run both smoothly and successfully. Afternoon: Participants arrive. 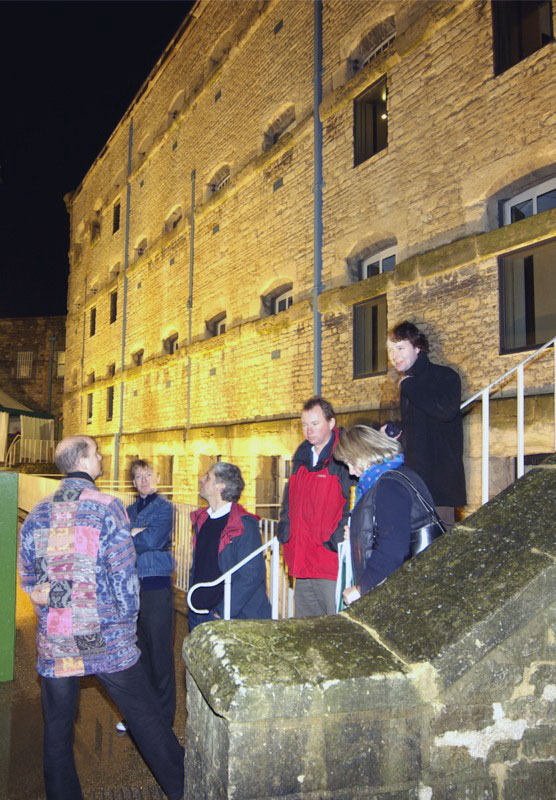 Tour of Oxford Castle site and presentations. 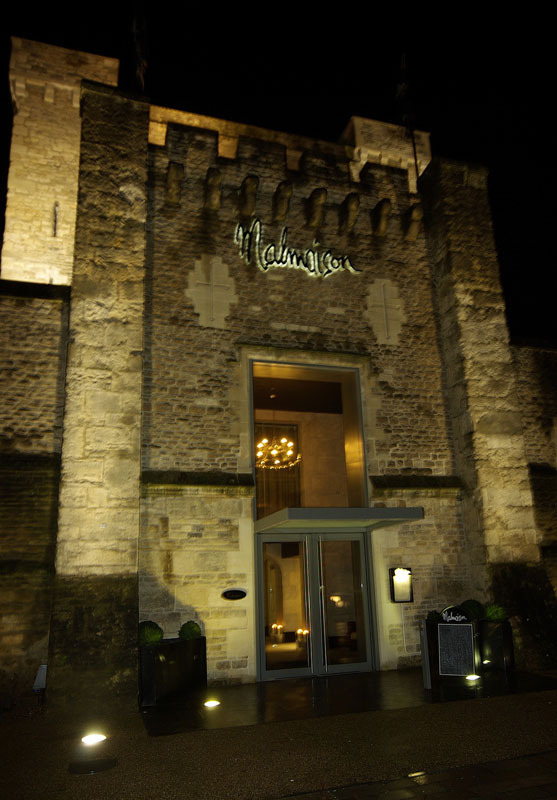 Evening: Dinner and informal discussions - towards identifying topics for breakout discussions on Saturday (e.g. how to integrate our techniques with questions posed by conservators and managers; how to integrate diverse lab, field, and computer-based science techniques better). Morning: Methods presentations: Session 1. Followed by short breakout discussions. Afternoon: Methods presentations: Session 2. Followed by short breakout discussions. Morning: Methods presentations: Session 3. Followed by final wrap-up session. 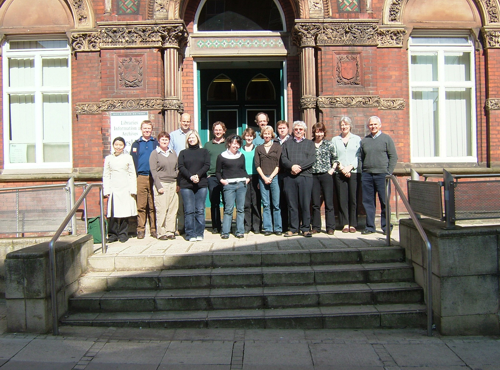 Our second meeting was held in Burslem on 2-4 April 2007 and focused on 'Methods in action: addressing issues of Burslem's historic environment'. 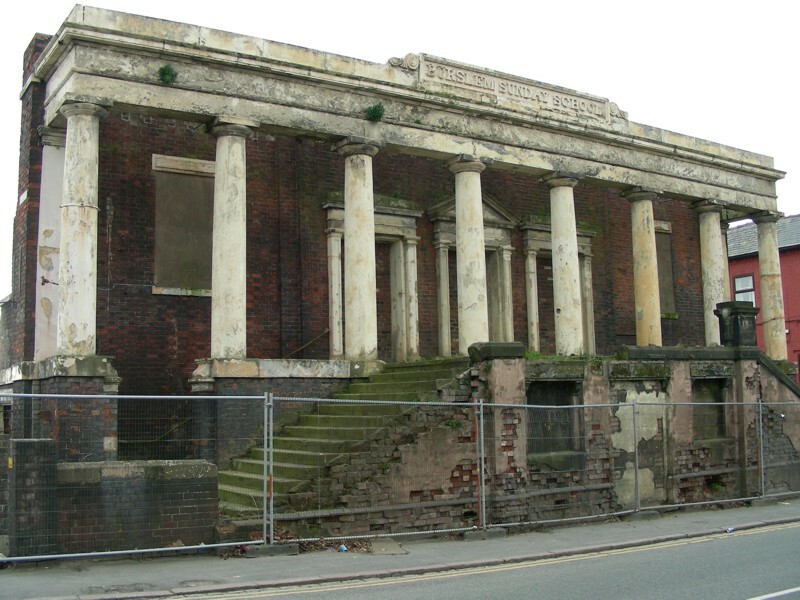 It presented participants with the problems of regenerating Burslem's historic environment. The meeting was well-attended by those who were at the previous meeting in Oxford, but also included new participants including Claire Doherty (University of the West of England), Menna Jones (from London Metropolitan University - who attended on behalf of Stephen Shaw), Haida Liang (Nottingham Trent University), Helen Lloyd (National Trust), Andrew Smith (Daresbury Laboratory), and Janet Wright (Staffordshire University). In all, there were 18 participants at this second meeting of the research cluster, representing diverse expertise and backgrounds in sciences, social sciences, arts and humanities. 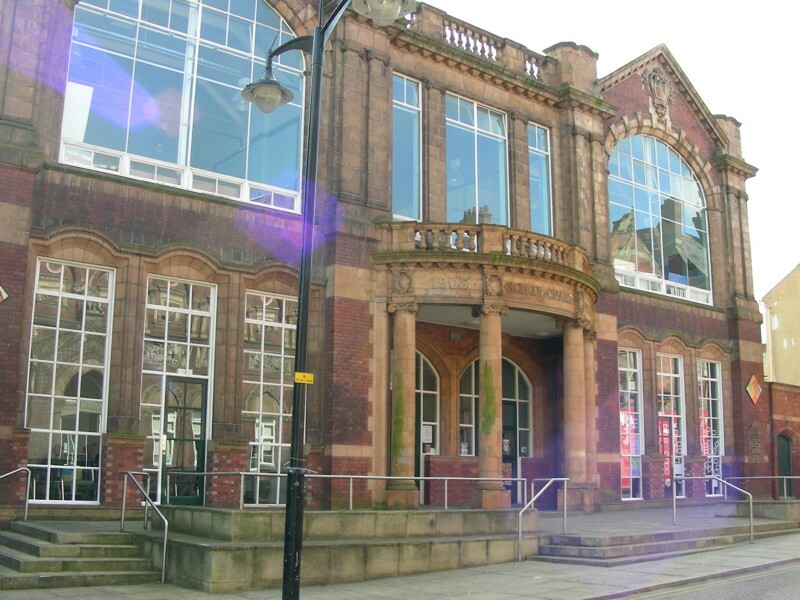 Janet Miller from Atkins played a key role in this meeting, as she had already done much work on regeneration in Burslem, as did Paul Rooney (University of Wolverhampton) who had previously produced video artworks here which were shown at the meeting. 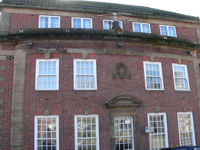 The Burslem School of Art was the venue for this meeting and provided good facilities and excellent catering and The Swan Hotel in Burslem provided well-priced and centrally located accommodation. 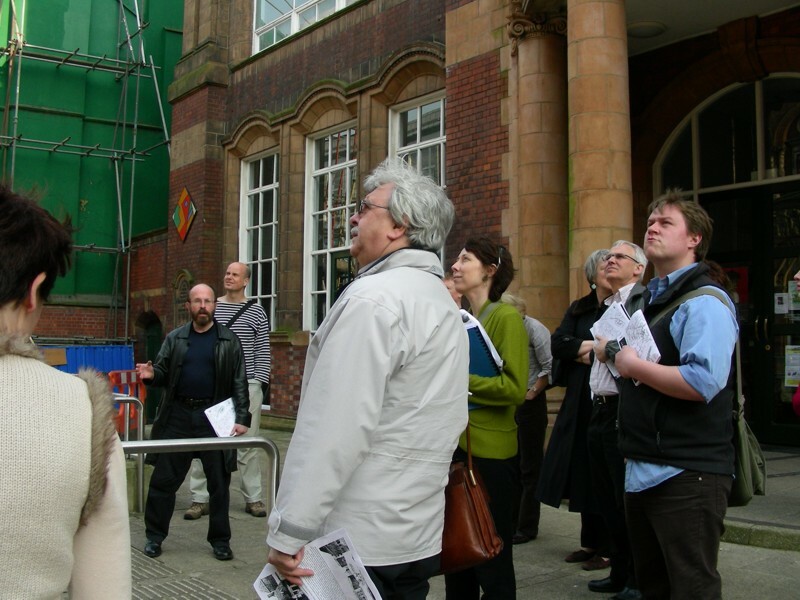 After an introductory session at the Burslem School of Art involving a talk from Katie Daniel, from EPSRC on applying for research funding for interdisciplinary projects, local social historian Andrew Dobraszczyc enthusiastically provided the group with an enjoyable, detailed historical tour of Burslem. 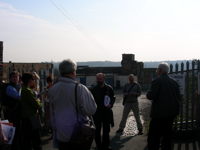 The next day, the group divided into four groups and worked on developing interdisciplinary research proposals focusing on the historic environment of Burslem. 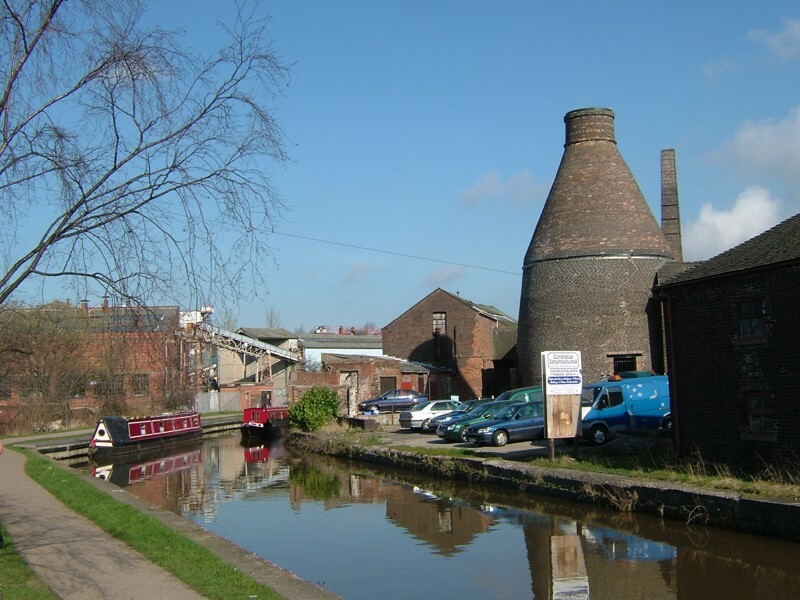 The Senior Archaeologist for the Stoke-on-Trent Archaeology Service, David Barker, inspired participants with a talk reflecting his extensive background knowledge and experience. 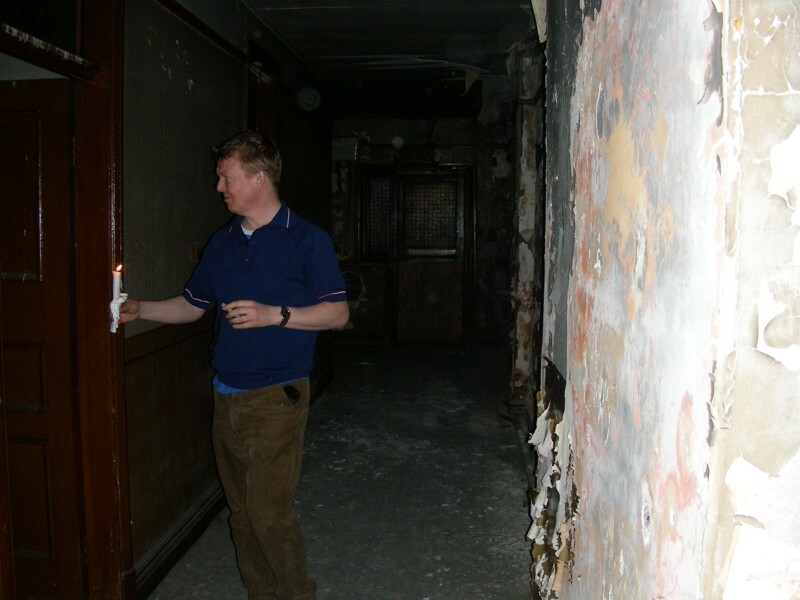 This was followed in the evening by a candlelight tour of The Leopard, one of Burslem's first pubs, where tours were arranged by David Harvey to see the abandoned and unrestored bedrooms within this extensive property that is scheduled to be reopened as a hotel soon. On the final day of the meeting, groups presented their project ideas and we discussed the challenges experienced in working in an interdisciplinary setting. A first view of Burslem by the canal side on the way into the town centre from the rail station at Longport. 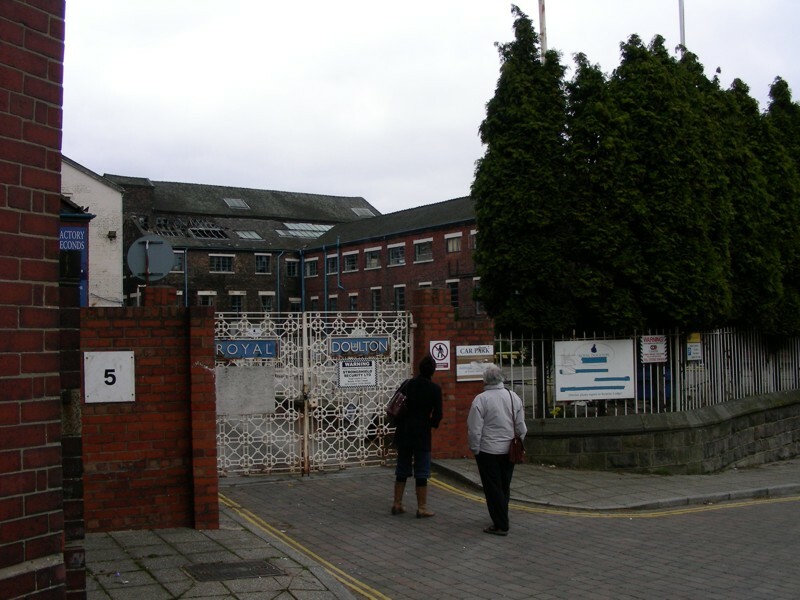 The town centre with Ceramica in the background and a statue of Sir Henry Doulton (1820-1897). The George Hotel in Swan Square, which is providing accommodation for this meeting in Burslem. 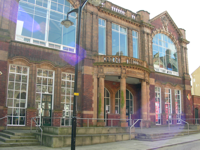 The Burslem School of Art is the venue for our meeting. 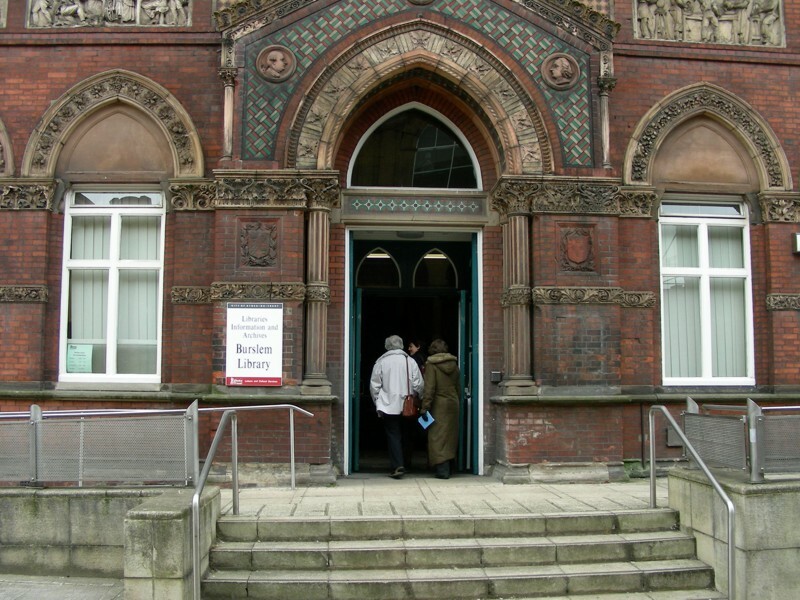 Directly across the street for the School of Art is the library. 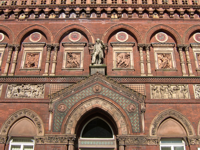 Notice the intricate carvings on its façade delineating the craft of pot-making. 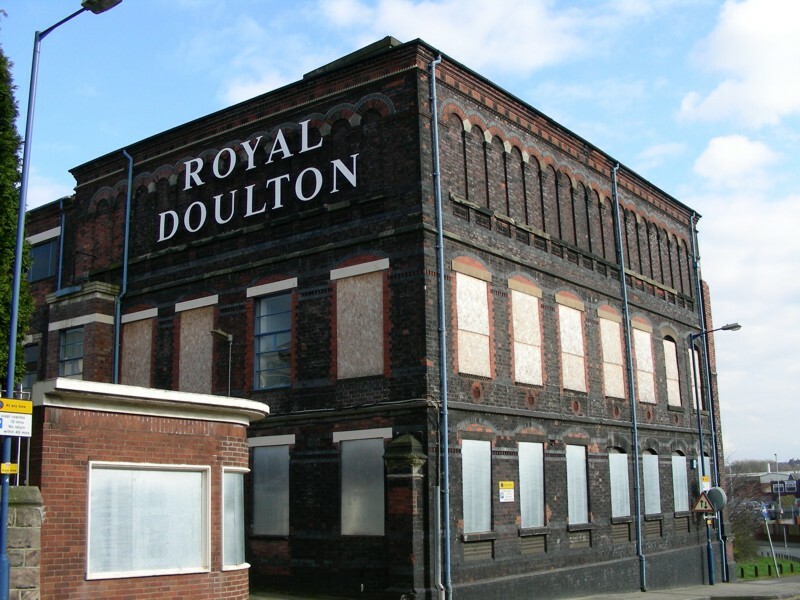 Now closed is the Royal Doulton factory. What remains of the Burslem Sunday School - its façade. 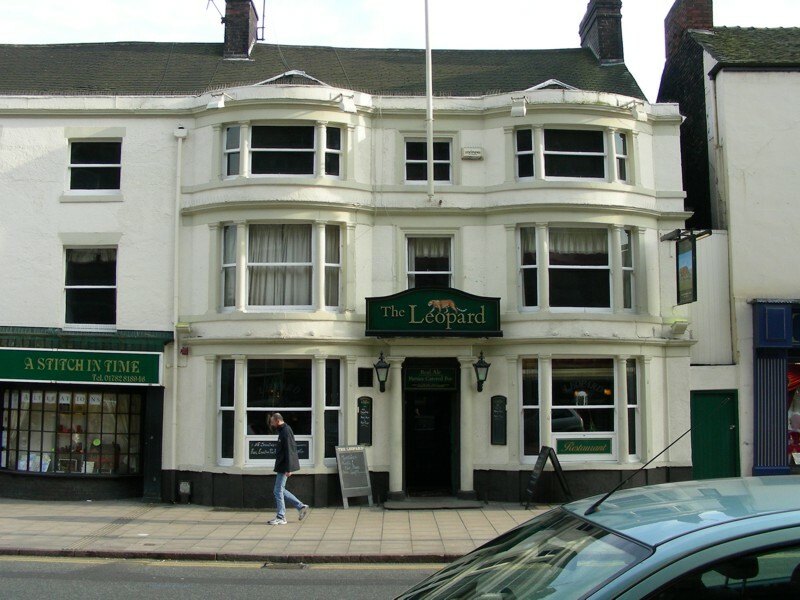 The Leopard is reputed to be the oldest pub in Burslem. 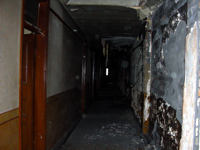 It is now undergoing renovations to establish itself as a hotel. 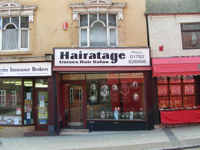 Charles Darwin is supposed to have stayed here whilst in Burslem. 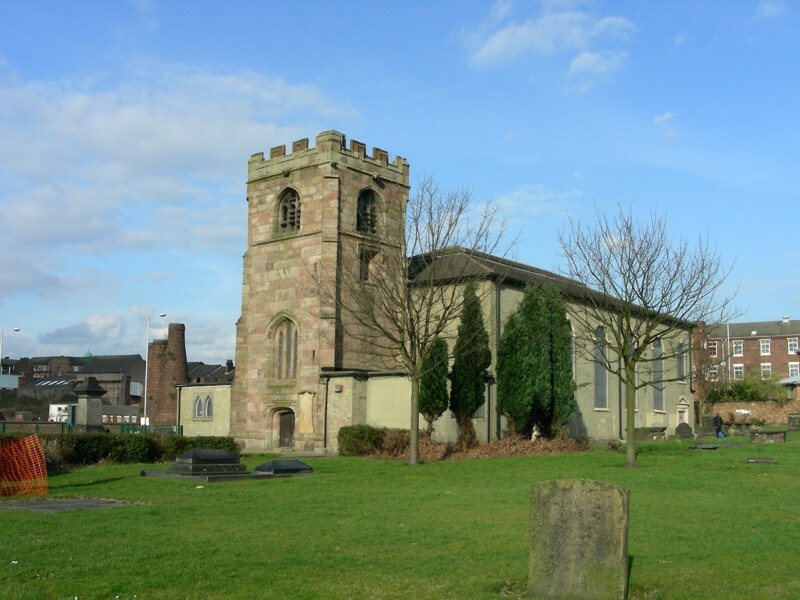 The church and its grounds - where the remains of local writer Arnold Bennett are supposed to be kept. 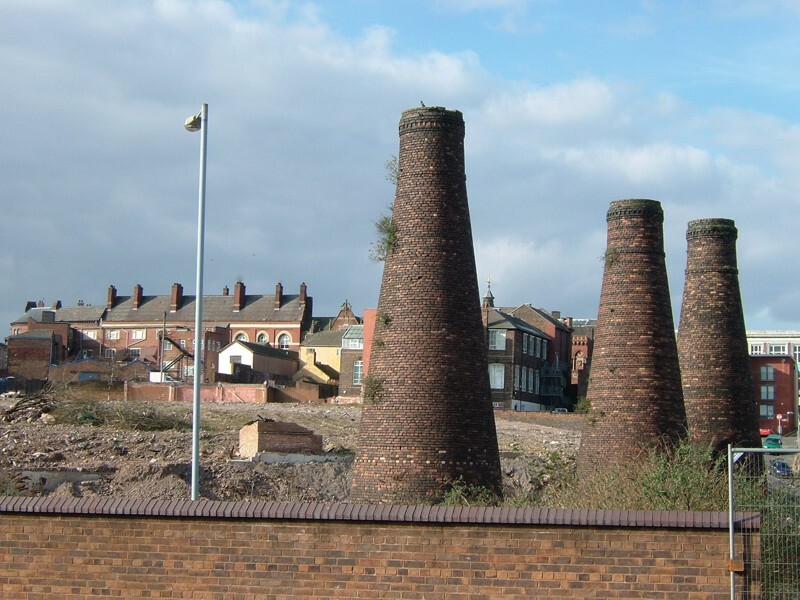 Bottle kilns in the 'Mother Town' of the Potteries. Finally, the general topic of our meeting - to discuss 'heritage'. 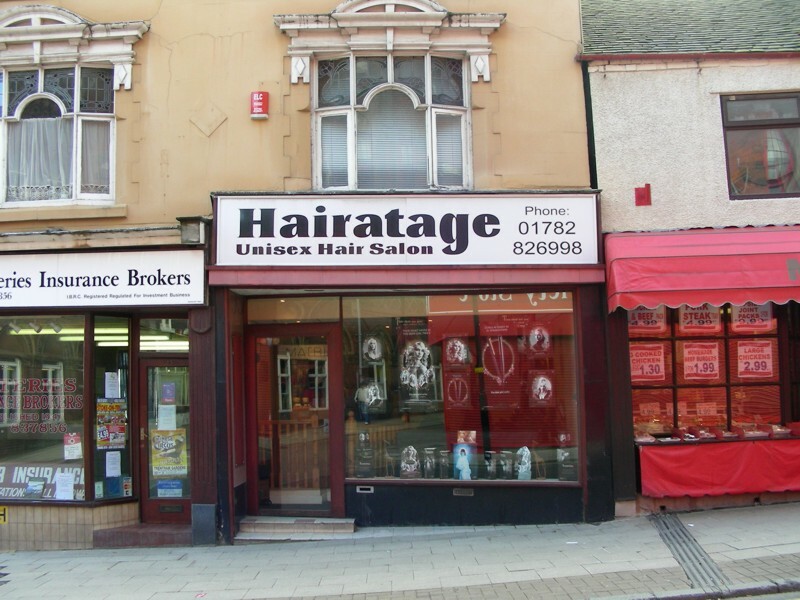 Burslem has some funny names for hair salons! 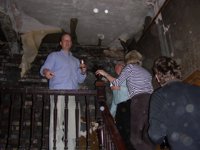 Andrew Dobraszczyc in action during his historical tour of Burslem. 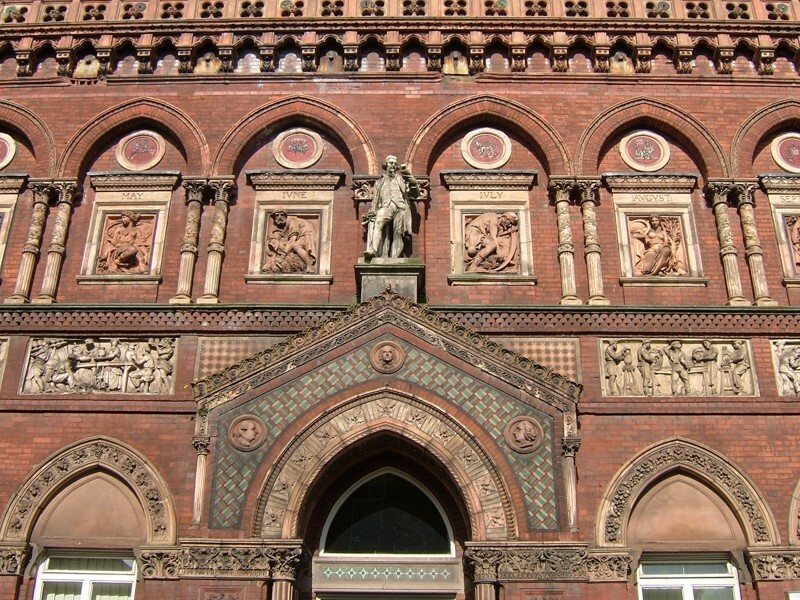 Looking across the street, during the historical tour, at the Wedgwood Institute directly across the street from the Burslem School of Art. 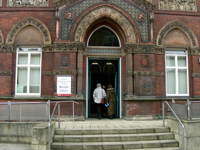 The Wedgwood Institute, now used as the town's library. 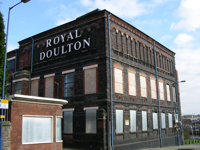 Visit to the now closed Royal Doulton factory. 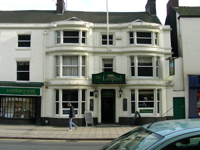 A view of The Leopard - one of Burslem's earliest pubs, which is now in the process of being repaired to provide accommodation. David Harvey leading a group on his candlelight tour of The Leopard. 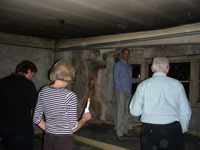 Group members 'sticking together' during the night tour. 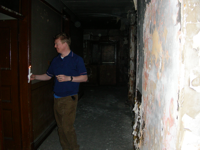 Paul Rooney investigating alone... in the dark! Photographs by Mary Thornbush and Heather Viles. 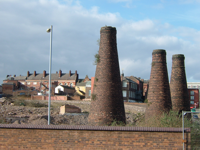 Should anyone wish to see more photographs from our visit to Burslem, please contact Prof. Heather Viles. Our final meeting brought together the core participants of the research cluster on day 1 to discuss and hone the research proposals which had been initiated at the Burslem meeting. Each of the four groups developed their draft proposal and prepared a group presentation on it. The presentations both summarised what each group planned to do and also reflected upon their experience of the process of inter-disciplinary research project development. Worcester College bar, opened specially for the group, provided a warm and welcoming environment for further informal talks and discussions after dinner. The second day of the meeting involved formal presentations to an invited group of researchers, policy-makers, end-users and representatives from research funding bodies.